From left - Gerard Lee, (someone from Marketting, I'll get their name later), Greg Lombardo, Aaron Archer (Designer), Mike (Brand Manager). This was a panel to detail how Hasbro worked with Paramount and the Movie people to get them educated in Transformers and to make sure that the Movie was faithful and respected their Transformers property and Heritage characters. By making it a condition to have Brian Goldner (Hasbro's Chief Operating Officer) as an Executive Producer, they were able to prevent radical changes (without vetoing anything) and still make compromises to benefit both parties. Brian and Aaron were involved in the creative process almost from the beginning, way back in late 2005. - What are Transformers? They are Alien, Sentient, have a Spark and Freewill, each has a role/purpose, and maybe a human origin (this was only a concept thrown in to this presentation to the movie people, as a possible angle for their story arc relating to possible origins, but was later thrown out since it wasn't used by the Movie writers, and does not reflect Hasbro's view of the existing Transformers Universe). Earth is central, was highlighted as an element of Transformers. - The are not indestructible, and require repair. - They have a POV (point of view) 'scan mode' for their vision, which was something US Target used for their Movie promotion and Robovision Prime, and that POV scanning was apparently included in the movie for Target. - A photo of a carpark with one having an Autobot symbol to represent that they could be anywhere as Robots in Disguise. Photo was actually the Hasbro HQ parking lot. - A shot of their scale on Earth, with some art of certain characters with Humans to highlight their size from our perspective. - Optimus montage, representing his character role of Leadership. - Bumblebee montage, representing his character role of youth. The rest of the presentation (not shown) goes into the expanded universe of Transformers. Next up was detailing their 3-phase marketting strategy - Build the Buzz (Classics line for nostalgia), A Movie Blitz (during release of Movie and DVD), then Continue the Momentum. A diagram was shown covering their three elements of the Transformers property - Robots/technology, Characters, Transformation - with the desired middle ground incorporating all three equally. A diagram mapping out their demographics and the sublines they target certain age groups. One end had things like the Roleplay for the youngens, the Core items in the middle, and the collector items for the older consumers. As mentioned above about US Target and the Movie, Hasbro worked quite extensively for their exclusive product range, so that Target could market themselves as the home for Transformers Movie toys. This partnership had followed from their recent successfull Star Wars partnership. Hasbro mentioned elsewhere this weekend that Walmart dictates case asssortments (and the rest of the world gets stuck with it), but it sounds like Target are trying to compete to get priority attention from Hasbro. They talked about how they had to get Takara to test if the Animation models from ILM were even possible to make as toys, and often the original animation models were rather devoid of recognisable vehicle parts, making them look rather generic in robot mode. With characters like Optimus and Bumblebee, and Jazz's visor, Hasbro fought to have them done differently to ILM's original animations, but had to make (visual) compromises on other characters in return (as long as it could still be engineered as a toy). The Computer Game characters (designed by the animators of the computer game), were done up by Hasbro's own art department, and tried to give them as much 'movie style' as possible to blend in with the ILM generated character designs. One of the Takara Designers was present (there seems to be some each year, but going to an American convention is not surprising if they are big fans - I'd do the same - actually, I do...). Not sure of the name, but he was the designer of the actual toy version of Barricade, Ratchet, Starscream, Jazz and Classics Starscream. (what a legend). Pity his english wasn't that good, because those Takara designers who seem to be at BotCon in recent years would be a better guest than some of the ones there this year. (this is after all a TOY convention) Have the organisors pay for a translator, (some fans would probably even volunteer) and what an awesome panel that would be. They talked about the Movie's partnership with Pepsi/Mountain Dew - and that it was organised through Paramount's own corporate contacts, and nothing to do with Hasbro, but maybe they might do a vending machine toy (inspired by the movie 'character') for the fans. Hasbro actually expected Soundwave to be a major character in the Movie, based on early story ideas and cast listings, but couldn't make it work in the scope of the movie in terms of its alternate mode or as a toy, so Soundwave eventually became Frenzy (AND Blackout according to the Writers). Most general toy concepts being released at the moment (like Real Gear, Robot Heroes, Slammers, and probably TECH) were prepared around 2004 and put aside for the one big release around the movie. I think they showed the prototype for the Optimus Voice changer helmet in this panel, because I remember the photo being shown, and it being explained that it was only meant to be a mock-up, not a prototype for a Gen1 Optimus helmet. 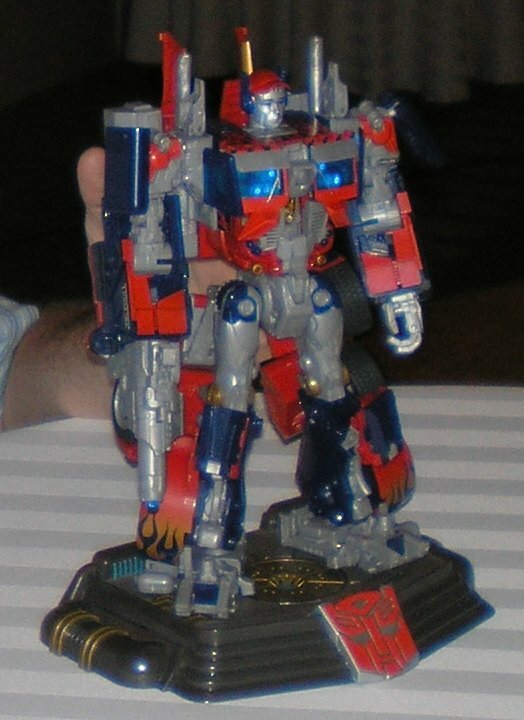 When they planned to do a helmet for the movie, they didn't know what the head of Movie Optimus would look like, so just did up Gen1 Optimus instead. The point was not to see what it would look like, but to see if it were possible to relocate all the electronics from the chest panel of the Darth Vader helmet, up into the helmet itself for the Optimus helmet. It was obviously possible, and later when the Movie Optimus head sculpt was definite, they made the helmet to match. (As much as some fans might want a Gen1 accurate Optimus helmet, the number of Movie Optimus helmets produced would probably limit sales of a Gen1 Optimus helmet, preventing Hasbro doing a sculpting change). The Battle Blade Optimus used in the Movie was a complete surprise to Hasbro, which they only found out about in March (mustn't have been in the original script). Since Hasbro found out about it so late, it was too late to incorporate it in any of the transforming Optimus toys, but they were able to work it into an upcoming Robot Heroes figurine. 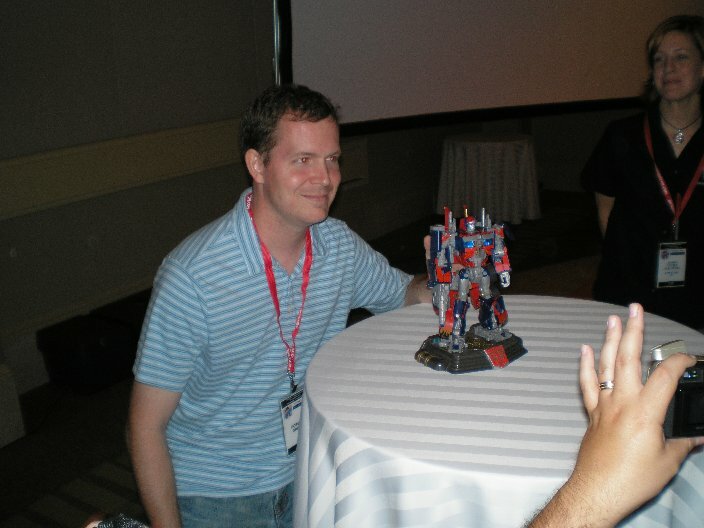 And at the end of the panel, there was a presentation to the winner of a competition held last BotCon, in which a winner would be presented with a one-off Transformers toy - Leader sized Movie Optimus with a head sculpted to resemble the winner. Below is a photo of the winner Robert Greer, with his toy, sporting its own moulded cap and was done with clear (painted) plastic so that the eyes would light up when the electronic gimmick was activated. Not that he'd be selling it any time soon (not sure how much of a fan he is), but if it was ever auctioned off, I wonder if it would go for much (rare yes, but head resembles the original owner).